A first-place finish and a huge crowd of fans greeted the Cadets (93.70), as the corps returned to its hometown of Allentown, Pa. Friday, Aug. 2 for day one of the two-day DCI Eastern Classic. "At this point, we're trying to reach a level of performance that's pretty extraordinary," Cadets Director George Hopkins said. "The way the program is put together, it's really on the kids' backs — the design can only take us so far." Hopkins said the performance went well, considering the changes the corps' production "Side By Side" has gone through recently. "I think everybody knows it's going to be a close World Championships [competitively]," Hopkins said. "But we teach the kids that they can't get caught up in the competition too much; you've just got to keep working." Santa Clara Vanguard (2nd, 93.45) edged closer to the Cadets, leaving just a quarter of a point between the two, the smallest margin of the season between the two corps. SCV placed second only in the Music captions, placing first in the other five captions. The point gap between Phantom Regiment (3rd, 90.00) and Bluecoats (4th, 89.05) continues to fluctuate, increasing 0.35 since their last meeting, July 30. Regiment Drum Major Dean Patterson looks forward to seeing some changes to the corps' production "Triumphant Journey" revealed on the field as the final week of the 2013 DCI Tour closes in. "We've always put our best on the field, but over the next few days we're going to be putting in some new things that will really excite the audience," Patterson said. Bluecoats Drum Major Willie Veenstra said the corps felt a lot of pressure coming into Allentown, especially now that the summer season is approaching its end. "It's always awesome coming into this venue; [J. Birney Crum] is such a big, open stadium, and one of the most historic venues in drum corps," Veenstra said. 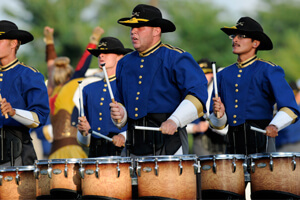 "The crowd's awesome; they've been going to drum corps shows since they were little kids. That makes it especially meaningful when we get a really nice response from them." 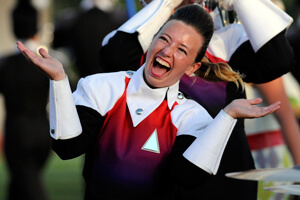 Bluecoats placed fourth in every caption except for third in percussion, topping Blue Stars' fourth-place line and Phantom Regiment's fifth. This marks the first time all season that Blue Stars (5th, 84.35) finished ahead of Spirit of Atlanta (6th, 84.10), with Spirit having finished as much as 1.05 above Blue Stars as recent as Wednesday. Troopers (7th, 81.65) improved by more than a point and a quarter since Atlanta last weekend. Drum Major Justin Anderson said the corps was extremely happy with its performance in Allentown, a feeling validated by a standing ovation from the cheering crowd. 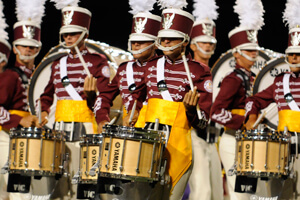 At the DCI Southeastern Championship the previous weekend, the Troopers placed 13th, just one spot out of a coveted top-12 finalist placement leading into the DCI World Championships. "We're always about putting the best performance we can on the field, whether that means top-12 or not," Anderson said. "Our primary goal is to entertain the crowd."